Posted By:Unknown | At:7:12 AM Be the first to comment! Near Big Bear Lake, California (CNN) -- It may take days before authorities can officially determine whether Christopher Jordan Dorner's body was found in the ashes of a torched cabin near Big Bear Lake, California. But several signs early Wednesday seemed to suggest that the ex-Los Angeles police officer's vendetta against his brothers in blue ended in that wooden cabin with a shootout that left one deputy dead and another wounded. The frenzied manhunt, road blocks and helicopter flights, which had brought the mountain town to a standstill for six days, died down Tuesday night. And late in the evening, authorities announced that they found human remains in the cabin and would need forensic experts to identify them. The deputy's death in the shootout Tuesday brought to four the number of people Dorner is accused of killing. Dorner, a man who vowed to kill police officers to avenge what he called an unfair termination, was first named a suspect in two shooting deaths on February 3: that of the daughter of his police union representative and of her fiance. Police also say he killed one officer in Riverside, California, and wounded two others Thursday. Authorities offered a $1 million dollar reward in the case after Dorner's burned truck was found on a forestry road near Big Bear Lake on February 7, about 100 miles east of Los Angeles. Officers converged on the remote area but the trail went cold for days. On Sunday, the San Bernadino authorities said they had scaled back the search. That all changed Tuesday, where arguably the most wanted man in America was finally spotted. 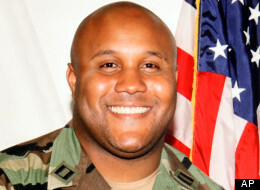 The question of where Dorner was between February 7 and Tuesday was unclear.